The kids have all the trick or treat candy to look forward to this Halloween. but unless you are a big fan of Dum Dums and Milky Ways, you are kinda out of luck. UNLESS…you've got some fun little Halloween beverages up your witchy sleeve! I think you will happily let the kiddos indulge in their Smarties, while you sit back and enjoy this Cherry Black Widow Martini. And, I've joined forces with some other creative evil geniuses to give you several more ghastly concoctions. Check them out at the end of the post. Halloween has always been a great holiday to bring out the ghoulish in all of us. It's fun to see how we out gruesome each other in food and drink. These Black Widow Martini, complete with ‘blood' dripping down the side may just be my most favorite Halloween drink concoction to date. I made the cherry syrup weeks in advance and froze it until I was ready to use it for these Halloween Martinis. Without a few drops of blue and yellow food color, your martini is deep red…so it's your choice whether to go black or red. While I usually avoid food color, at the end of the day, it's worth it for the black color for these Black Widow Martinis. I did try a charcoal capsule and it did turn the martini black, but there was some sediment leftover in the glass that I didn't love. But, if you'd rather go that route, it definitely works. And, by thickening a little bit of the syrup, I was able to get a slow drip of ‘blood' down the side…definitely adding to the ghastly effect. So, without further adieu my creepy compadres, let's crack open the crypt and check out this Black Widow Martini recipe. 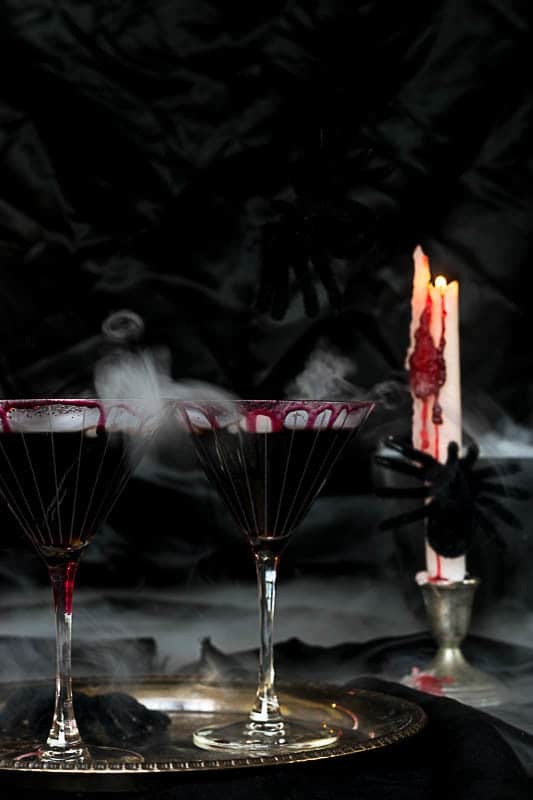 A delightfully ghoulish drink to serve at your Halloween party. Cherry juice makes a dark red drink, but with a drop or two of some blue and yellow food color, you can get the delightful black martini. Add some 'dripping blood' down the side of the glass for the perfect creepy effect. Strain cherries in a mesh strainer, pushing down solids to release juice. Use or freeze within 7 days. To make your martini black, add two drops of blue and one drop of yellow food color to the shaker. To get thick 'blood' to drip down the side of your Martini, put 3/4 cup of cherry syrup into a pan and simmer slowly until molasses thick. Hold the glass up to get the 'blood' to drip down. Rotate around the glass, dipping and then let it drip down. And I've been holding on to these Dreadful Drips Tapers by Yankee Candle for just the right occasion…aren't they just perfectly awfully disgusting!? 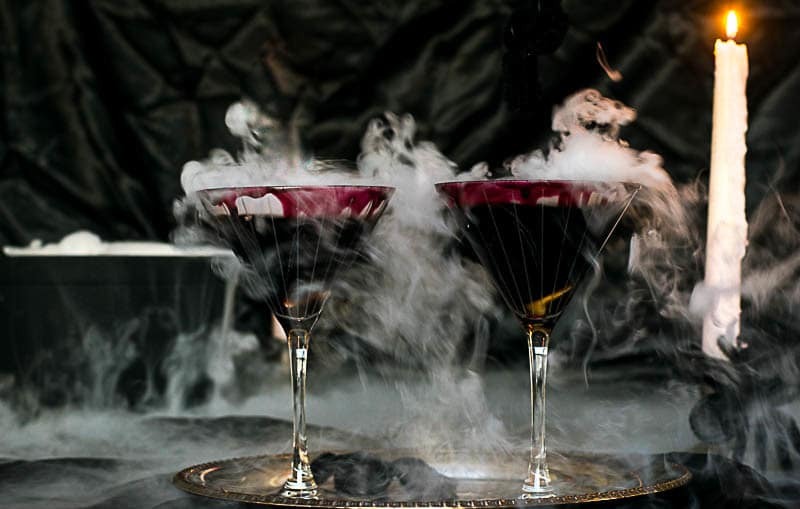 Oh, and you can add a little bit of dry ice to your Black Widow Martini to get it to bubble and smoke. Dry Ice is nothing more than frozen carbon dioxide, the same carbon dioxide that makes coke bubbly. That being said, you don't want your lips to come in contact with the dry ice, it will burn any part of the skin it comes in contact with. So, just put a small piece, like a 1″ chunk in your drink to give it the desired effect of smoking and bubbling. And for what it's worth, you will get more ‘action' from your dry ice if the liquid it is being dropped into is on the warm side, the dry ice will definitely chill your beverages. Pop on by to see some of these other great and Oh So Spooky cocktails shared by these other creative witches. Michelle, that dry ice is fun to work with, just don’t touch it with your bare hands. But it just really took this drink to a different level…and so fun to photograph. This is so cool and spooky but it sounds yummy! The dry ice is a great touch for the photos and that drippy candle is awesome! I love the entire thing! Aw…thanks so much Michelle. I’ve got to be honest, I had a ball making and photographing these drinks. Maybe I was a mixologist in a previous life?! This drink is stunning! I will gladly let the kids have the candy and enjoy one of these myself. Now off to find some dry ice before our Halloween party! Thanks friend! It was so fun to make (and drink) and photograph! Dry ice is the bomb! WOW this is so spooky, creepy and gross… in the most delicious way possible! I love cherry anything, and I think I even have all of the ingredients to make it. Can’t wait to give it a try. P.S Your photos are amazing! Aw thanks Heather. It was a delicious drink and it was soooo fun to photograph. Dry ice is the bomb! The perfect drink for this weekend…or any weekend in October!